I've said it a thousand times here that I don't believe in any of the deities, but I will admit I like the idea of them. I find them fascinating and believe they can exist within our own minds, but not outside of it. That being said, the Triple Goddess is a beautiful representation of the phases of a woman's life, the changing seasons, and the moon phases, but is it perhaps time to redifine her? After reading Hedge Witchcraft by Harmonia Saille, my feelings regarding the use of the Triple Goddess changed. The Triple Goddess is supposed to represent the changing seasons, the phases of the moon, and the stages of a woman's life, but Harmonia suggests using four because in reality we have four seasons, four moon phases, and women have four stages in their life. Spring, Summer, Fall, and Winter are all very distinct seasons with certain sabbats falling within each to represent those seasons. We don't really see too much of spring or fall here in Georgia, but the traditional associations are still there. Using only three goddesses to represent these four seasons seems a bit odd. Which do we lump together into one? Furthermore, fall really doesn't match the crone phase, but it doesn't match the mother phase either. The same goes with the moon phases. We have Waxing, Full, Wanning, and Dark. The crone doesn't really fit in the wanning moon phase in the three-phase system, but she fits quite well in the dark or new moon phase. So viewing the seasons and moon phases as a set of four means we are missing a Goddess form. Today, people are living longer, meaning women transition into their Crone stage much later than before. However, many women move on from their Mother phase well before becoming a Crone. My mother is one of these women. She has left her Mother phase, but isn't quite in her Crone years either. So what is she? This phase is the autumn of life. In the three-phase system, postmenopausal women are left out, but by switching to a four-phase system we create an archetype to fill this gap. Harmonia calls her the Harvest Queen. After doing a bit of research, several others have also used the word queen to describe this portion of a woman's life as well. I think this name is suiting because queens are wise, independent, and strong, yet still nurturing and young at heart. When I think of the word queen I see Queen Elizabeth I, a woman who was known for having fun, but being strong and independent as well. Queen suits postmenopausal women in the autumn of their lives quite well in my opinion. This system works beautifully and includes women who have otherwise felt left out. If you would like to read more on this subject, Donna Henes wrote a great piece on the topic of the Queen while Wind Hughes posted an article from Sowell Magazine (2000) about the four phases of a woman's life, their meanings, and their "light and dark" sides. So we finished the office! Actually we finished it back in May, but I have been so busy I haven't had a chance to upload the pictures and write about it. So without further ado, here is our completed office! To start off, I painted all the walls except one white. The other wall was painted jade green. 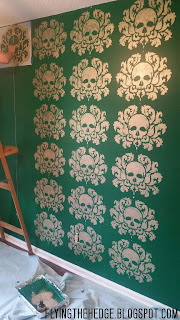 The stencil I created and cut myself, and my mom came over to help me stencil the room properly. I'd never done something like this before and wanted to make sure it was "even." 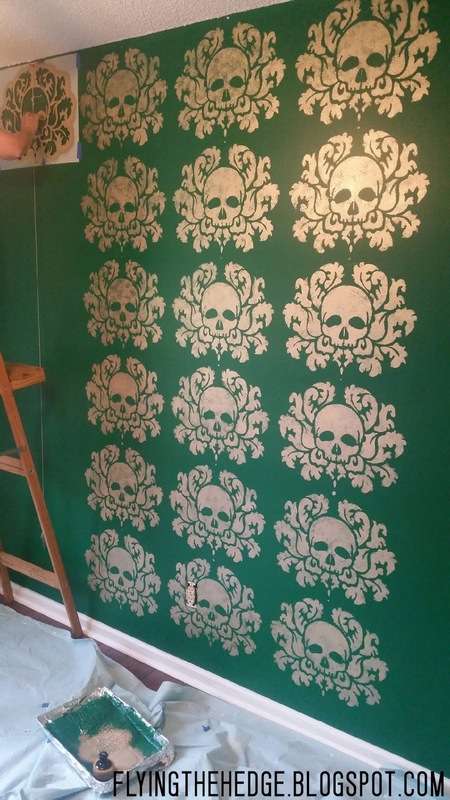 After getting the entire wall stenciled withe the skull damask print in gold, my husband and I sanded, conditioned, stained, and sealed three pieces of pine. We brought up the base cabinets and set them far enough apart to give us roughly 29-30 inches of space. Two of the base cabinets were originally kitchen cabinets my dad pulled from a couple of jobs while the third was a desk cabinet. They were all different colors so I sanded, primed, and painted them with a semi-gloss white paint to have them match. The middle bookshelf cabinet was an upper cabinet with a divider and I actually cut it out. It doesn't fit full sized books, but it works well all the same! We carried the boards up and dragged them in through the window to fit them in the room. We fit them together using some metal brackets and connected them to the cabinets with small L brackets. Once the desk was put together I began decorating. I hung our L and J above our respective seats, my husband decorated his side with all his...things...and we hung some shelves up. My dad also brought us over a bookcase for added storage. Originally I was going to paint it too, but after placing it in the room I couldn't bring myself to do it. The dark wood tones match perfectly and fortunately don't make the room feel too small. I decorated it mostly with my collectibles (see, mine actually have value. I tease; I tease) from my Loot Crates. As I acquire more books the set up will evolve, but for now it works as is. And FYI, my plant is not dying, she is just shedding old growth and putting out new growth. There are still a couple things missing, but the room is mostly complete. I need a rug and some curtains as well as a closet door for the small closet in this room. Yeah, we still don't have closet doors anywhere in the house from when we put the floors in this past January. I'm still slowly making my way to painting all the trim around the house. Haha! So, what do you think?! Woo! So things have been super busy at my house. My nanny job ended, but instead of having more time I feel like I have less. I am been working nonstop on the two courses I am taking this summer while preparing for my first year teaching. Honestly, I need more time to prepare for teaching! My physics class eats 4-6 hours a day. I wish I was kidding, but it literally eats that much time between reading the material (about 150 to 200 pages per unit), doing the homework, taking quizzes, posting on forums, studying, and taking the tests. I can tell you, I still have no idea what we are learning. 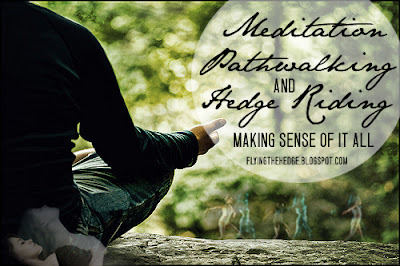 I am BSing my way through this course. Literally. When the final comes, I don't know what I am going to do because it is not open note like our other exams. Haha! Oh well! Anyway, we had a wee celebration for Litha last month. We couldn't do much because we both had to work and the budget is super, super tight, but we had a nice evening nonetheless. We started off the evening grilling up some veggie burgers and corn. I also made a light pasta dish and we gorged ourselves in front of a beautiful fire. To honor the holiday I burnt some rose scented incense and threw a mixture of herbs into the fire to bring good luck, protection, and peace. This mixture consisted of mugwort, lavender, thyme, and yarrow. Not going to lie, this mixture smells divine. We spent the evening after dinner watching the sun go down while we talked and laughed around the fire. Pretty simple and peaceful, yet very spiritual. How did you celebrate Litha this year?